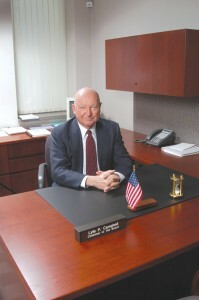 Lyle Campbell in his office in Paradise Valley, Ariz. It has been a remarkable journey for Lyle Campbell. As a successful banker in Illinois and Arizona, he has always made his own success in the banking industry and even been involved in aviation companies here and there. Yet through his steady climb to financial success, Campbell has retained his deep-rooted sense of adventure. It hasn’t always been easy. 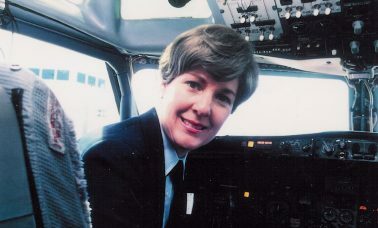 In the past few years, Campbell has raced around the world, had dinner with Prince Phillip of England, and been pardoned by Australian Prime Minister John Howard for dropping his seaplane into Sydney Harbour. His yearning for speed and distance culminated in his decision to run the London to Sydney Air Race in 2001. 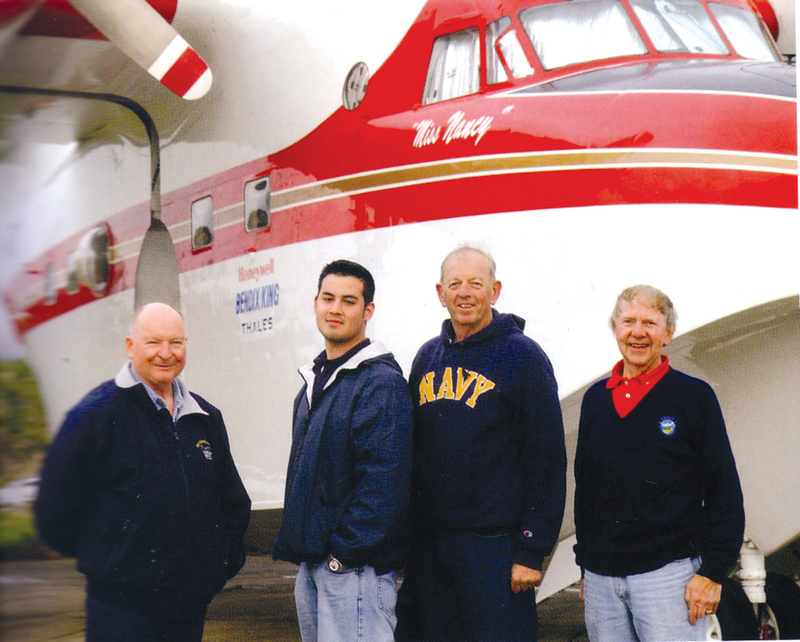 He and his team of handpicked aviators and crew covered more than 12,000 miles in a rebuilt 1954 Grumman Albatross. The financier has also documented the race in a 2002 book, “The Adventure Continues,” a hardcover compilation of photographs and recollection by Campbell and his team. Campbell, who lives in Paradise Valley, Ariz., said being in the right place at the right time is the secret to success. “I firmly believe that opportunities present themselves, and if you try to be right with people, things work out by themselves,” he affirmed. 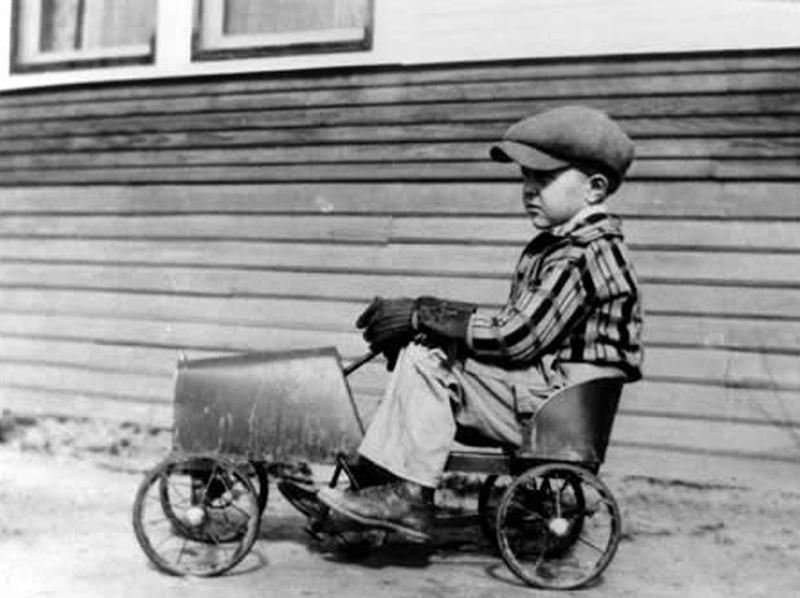 Once a farm boy in Illinois, Campbell learned his strong work ethic from his father, Marlowe Campbell, who started cultivating corn when he was 11 and stopped when he was 80. He also credits his wife, Nancy, with whom he has three sons and three daughters. After meeting in high school, they married soon after and have supported each other through more than 50 years of marriage. After a childhood of farming and a short stint in real estate, Campbell entered the banking business with Northern Trust Bank in Illinois. He earned his MBA from the University of Chicago in 1971, and bought his first community bank in Central Illinois in 1973. 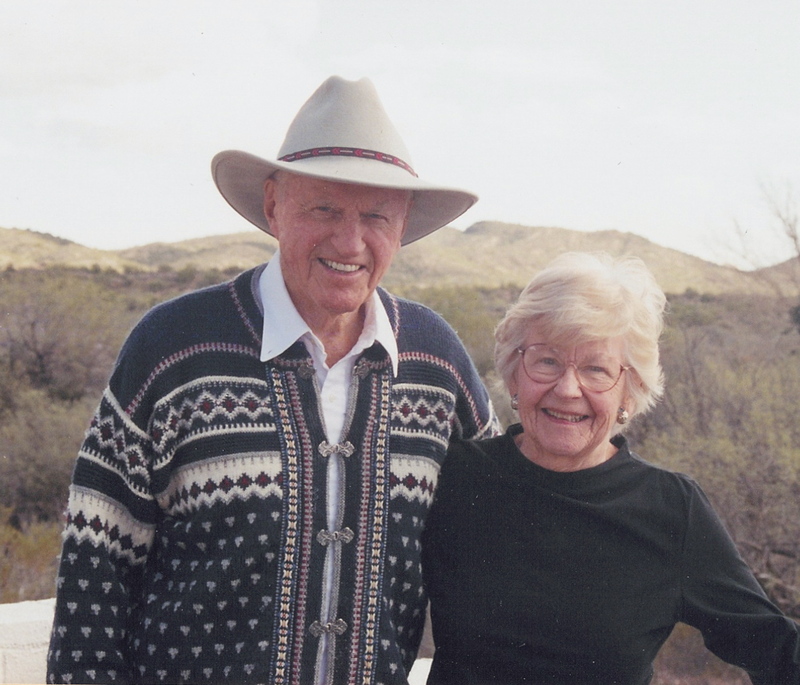 Attracted to Arizona, he chartered his first bank in that state in 1986. Over the years, his banking group, Founders Group, Inc., swelled to more than 30 community banks as well as a wholly owned subsidiary, Interbanx, which assists customers with foreign investment opportunities and other international business. Many of the company’s banks are still managed by his three sons and three daughters. “They grew up with that at the kitchen table. I never insisted that my kids get involved in the business. I think it’s a terrific business, but it was their decision. Maybe that’s why it has worked out as well as it has,” Campbell reflected. In November, he received the charter for a new bank in Scottsdale under the banner of Legacy Bank, which will be headquartered in the Scottsdale Airpark. The bank, which opened in December, will focus on private banking, serving high net worth individuals as well as small and midsize businesses. Campbell says it will be small enough to provide highly customized personal services, but large enough to provide for the specific financial needs of their customers. The firm has been training staff and remodeling facilities for six months. The fact that the new bank is at an airport isn’t the most unusual idea he’s ever had. Visitors at another Founders branch in Scottsdale find they can get Beethoven with their banking after Campbell put a baby grand piano in the lobby. Although he has reduced his involvement over the years, he still attends regular board meetings. In an era of enormous banking organization, Campbell still says banking comes down to people. “It’s obviously about human relationships. With these big banks, it’s difficult to maintain those personal relationships with customers and that’s one thing we think we do pretty well. The banking business is a pretty simple operation. The only thing that distinguishes one bank from another is the people who run it,” Campbell affirmed. 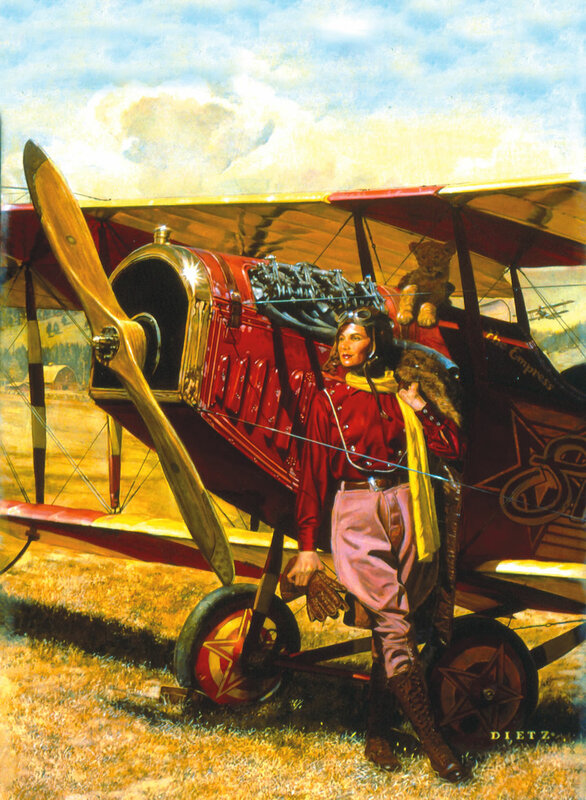 Campbell, long fascinated by airplanes, learned to fly before he earned his first college degree from Iowa State University, and eventually earned ratings in helicopters, gyroplanes and seaplanes. Today, he still pilots a Cessna 182RG that he shares with his son Scott and a Lancair 4P, a high-performance experimental airplane. He shares fractional ownership in a PBY, a WWII reconnaissance airplane housed at the Imperial War Museum in Duxford, England. 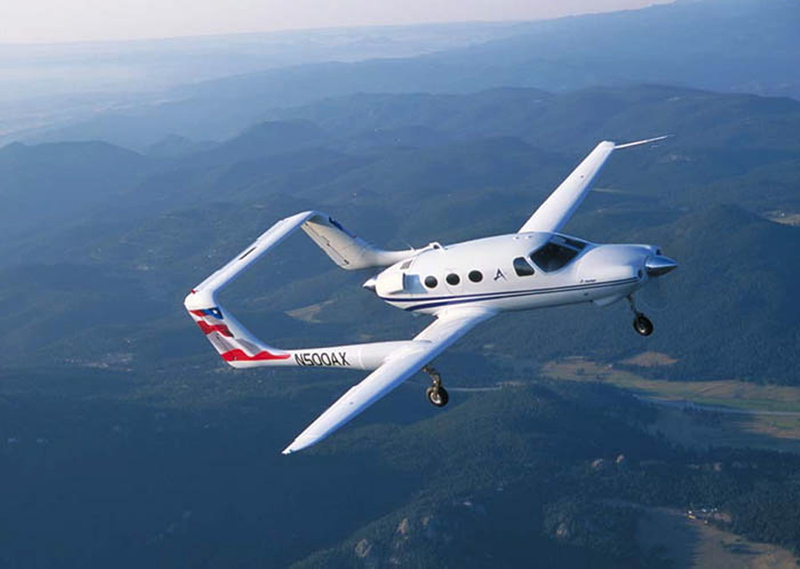 In addition to his personal aircraft, he is a partner in Aero Jet Services, a Scottsdale-based aircraft charter company and has the local dealership for Groen Brother Aviation’s gyroplanes. The great Grumman Albatross was used for reconnaissance and air/sea rescue in its previous incarnations. Campbell’s journey to Australia started inauspiciously through his accidental meeting with Dennis Buehn, the aircraft restoration expert and Albatross aficionado who runs American Warbirds in Carson City, Nev. A follow up to the Grumman Goose, the Grumman HU-16 Albatross is an enormous amphibian aircraft used after World War II for reconnaissance, search and rescue, and other military uses. Only 150 of the aircraft are still functioning from the 464 built. Fans of the aircraft include Jimmy Buffett, whose “Hemisphere Dancer” was only recently retired to one of his Margaritaville restaurants. “I fell in love with the Albatross. I had to find a reason to justify owning one of these things,” remembers Campbell. In 2000, he finally found a reason. It was a race organized by Australia to celebrate the centenary of flight, which followed the traditions of the Great Air Races of 1919, 1934 and 1969. It featured an international air armada of single and twin-engine aircraft representing nine nations. Out of the 38 entries, two women pilots lost their lives in a tragic crash off of Iceland, six planes withdrew and 31 completed the long journey. Originally, Campbell planned to race his 182 and then sell it in Australia. Campbell’s “Miss Nancy,” named for his wife, was the largest and most unusual racer in a field of fascinating aircraft that included a Robinson 44 helicopter. 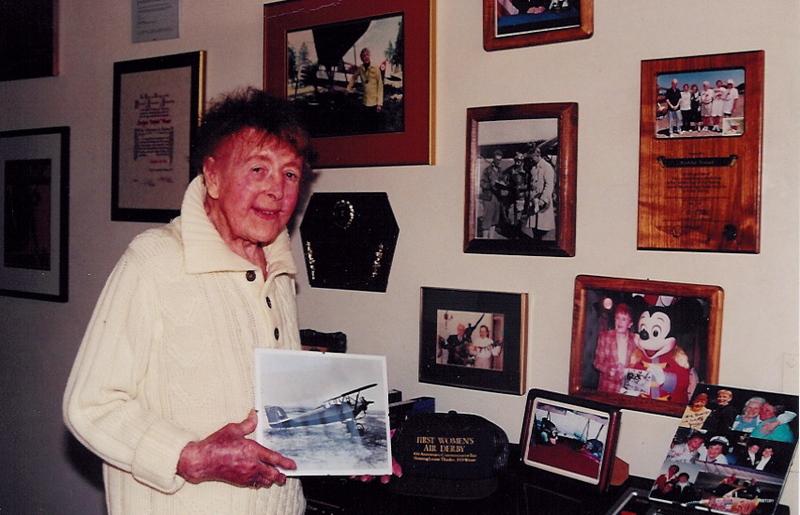 Buehn found the plane that would eventually become “Miss Nancy” on the beach in Barbados, where she had blown an engine and knocked off a pontoon during a trip to the Amazon. At Campbell’s behest, Buehn sent a team of mechanics down with a new engine and brought it back to Carson City. His next acquisition was to get a pilot; he got one of the most interesting guys in the business. Buehn introduced him to Captain Lonny McClung. 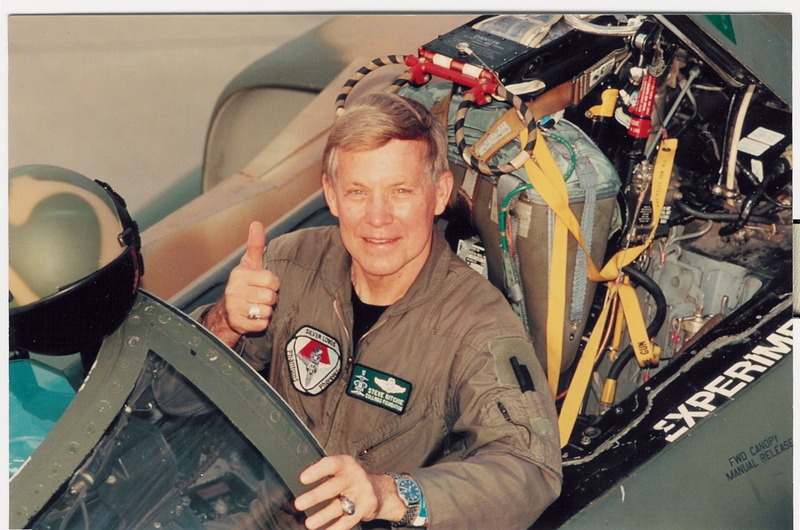 During a 30-year career as a carrier-based fighter pilot, he logged more than 7,000 hours, more than 1,000 carrier landings and over 250 combat missions in Vietnam. 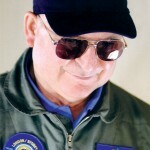 His commands included the famous “Top Gun” Navy Fighters Weapons School and a top-to-bottom clean up of the Tailhook Association following its early 1990s scandals. Campbell also brought on Frank Wilkins, a former crew chief on an Albatross assigned to air/sea rescue and support for the 1956 Bikini Bomb Test. The crew was filled out with Campbell’s son Scott, the president of Founder’s Bank in Illinois, and Samaruddin Stewart, a graduate student in journalism at Arizona State University who was hired to record the historic voyage. They ferried “Miss Nancy” to London, and the race began with a dinner at Australia House on the Strand where the crew met Prince Phillip, the Duke of Edinburgh. They left London on March 11, 2001. The race took the crew through some of the most interesting places on earth. 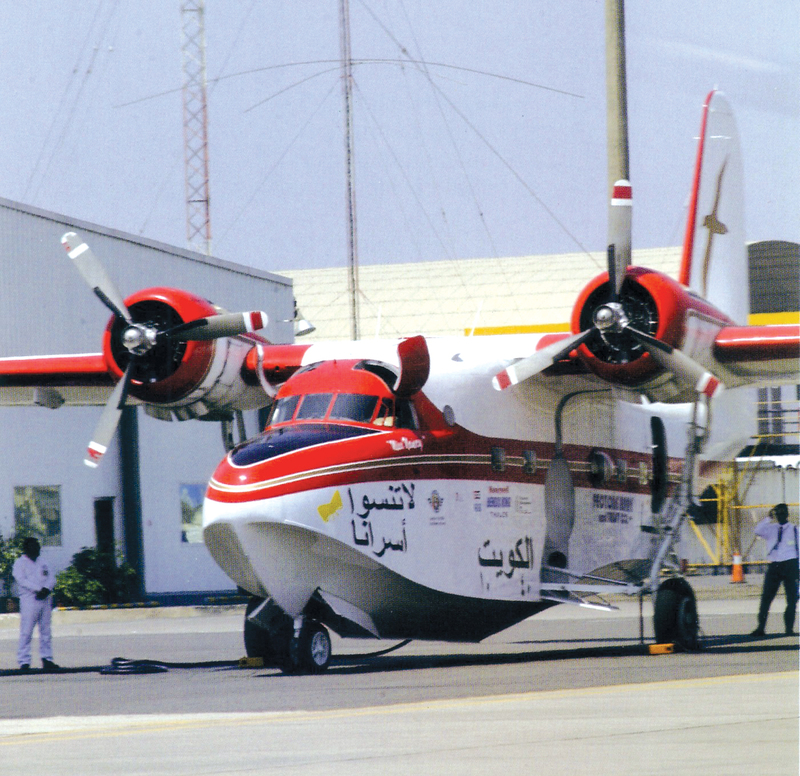 Among the destinations for the Albatross were Cannes, Cairo, Kuwait City, Calcutta and Singapore. They were welcomed to Saudi Arabia by Prince Turki and climbed up volcanoes on Easter Island. Halfway through the journey, the crew got a unique opportunity to visit the “USS Harry Truman,” which was stationed near Kuwait. 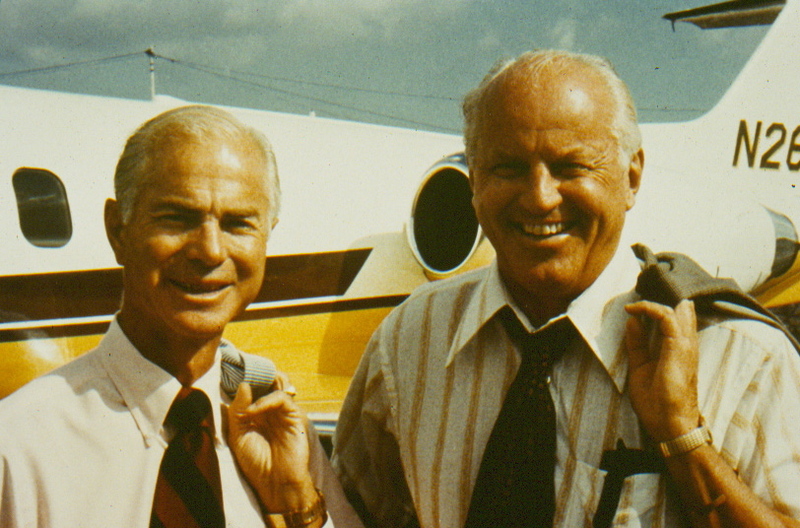 Lyle Campbell, Sam Steward, Lonny McClung and jeweler Wendell Setterburg arrive in England after ferrying the Albatross from Mesa, Ariz.
After a few e-mails, Admiral James McArthur sent a craft to Kuwait City to pick up Campbell and his team. “What a great experience that is. Everyone should get an opportunity to see one of these great ships in readiness, but not everyone gets a personal tour of the deck by the admiral. I sometimes wonder what some of those young sailors thought as we were being led around the deck by Admiral McArthur,” Campbell laughed. Finally, the team arrived in Sydney on April 7, 2001. Through some complicated negotiations, Campbell managed to procure permission to land in Sydney Harbour from Wilf Barker, the director of the air race. Unfortunately, not everybody in Sydney Harbour had gotten the message. “We came over the bridge and the air traffic controllers vectored us around like normal. There were a lot of sailboats and ferry boats around, but we didn’t do anything unsafe,” Campbell said. The “Miss Nancy” was taxiing past the Opera House when Sydney Harbour police showed up demanding the crew shut down. Even before their pictures ended up in the paper the next day, the crew of the “Miss Nancy” knew something was up when authorities from Australia’s Civil Aviation Association showed up when they landed in Bankstown. “They were going to confiscate the plane and confiscate us and take our licenses and promised every other damn thing,” Campbell laughed. 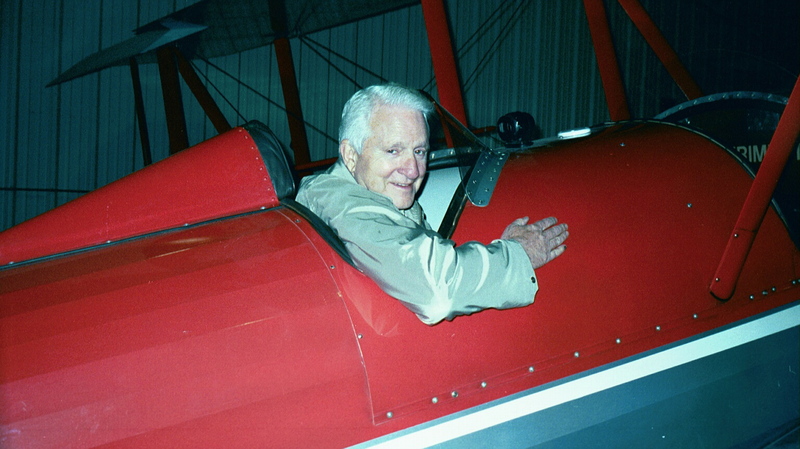 At that night’s awards dinner, Campbell managed to be seated next to Prime Minister John Howard and was able to relate the story, “straight from the horse’s mouth.” Prime Minister Howard began his remarks by congratulating the winners, but also noting the controversy surrounding the Campbell Air Race Team. “He told that audience that had he known he would have invited us to tea at the official residence. Right then and there, he administered the Campbell Air Race Team a full Prime Ministerial Pardon,” Campbell recalled. Of course, Campbell couldn’t just come home the easy way. The return trek took the “Miss Nancy” through Auckland, New Zealand, across to Tahiti and briefly stranded the crew on Easter Island. In South America, they passed through Lima, Peru and Panama City before finally coming back into the United States at Brownsville, Texas, on April 22, 2001. Fifty days, six continents and 12,000 miles later, their long journey was over. 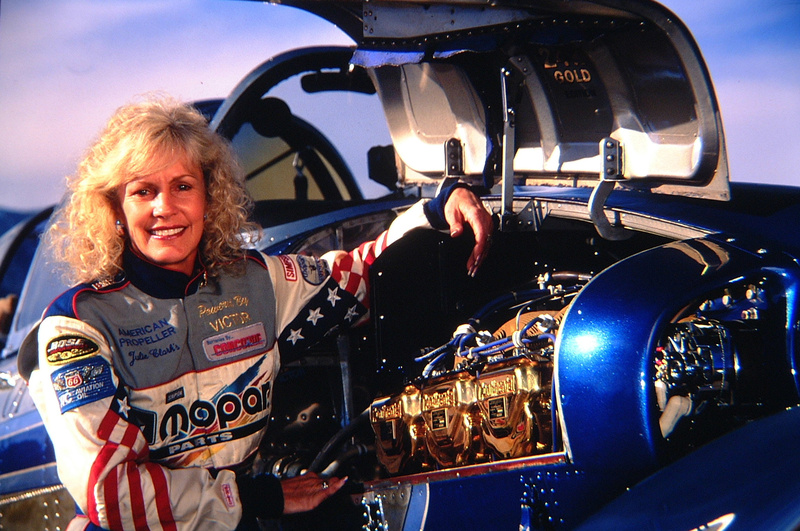 Lyle Campbell looks comfortable in his full-on Air Race 2001 gear. 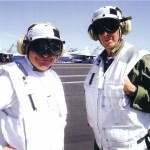 Admiral James McArthur invited Lyle Campbell and Captain Lonny McClung to tour the deck of the “USS Harry Truman” on their pass through Kuwait. 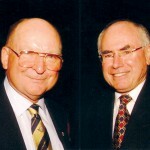 Lyle Campbell and Australian Prime Minister John Howard. The Campbell Air Race Team received a full Prime Ministerial Pardon for setting their seaplane down in Sydney Harbour.